You love the rush of fresh air in your lungs and the feeling of the unknown as you stare down the trail ahead of you—it's no wonder you want to raise an outdoors family. 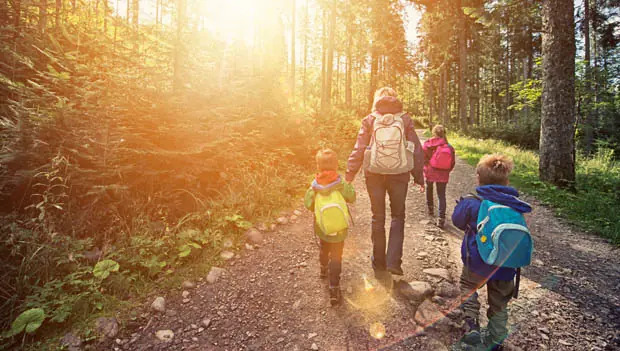 Use these 10 tips to raise a family who loves nature just as much as you. For small children, even finding an acorn is an amazing discovery. Start slow and make outdoors activities fun no matter what they are. Backyard campouts, playing catch or visiting local trails are easy ways to ease your kids into the outdoors lifestyle. If your child wants to turn around halfway up the mountain, don't force it. Though it's fun for you and your spouse, it can be very intimidating for your little one who just doesn't know how to express that. Perhaps next time they'll feel braver, but don't push it today. For kids, holidays are just a day off from school. Often times, you and your spouse get the day off from work, too, making it the perfect time for the family to get outdoors. Plan activities around birthdays or summer holidays like Memorial Day and Labor Day so your kids can start to associate good memories with the best times of year. As your children get older, make one simple rule: no whining. Michael Lanza, the Northwest Editor for Backpacker Magazine, and an outdoors family blogger, explains, "Tell your children they can talk about any situation they're not happy with, but draw the line at complaining just to complain. Everyone will be happier." Whether they climbed a mountain or helped set up a tent, be sure to praise your children every time they do something right. The same goes for your spouse. That good feeling will resonate as everyone thinks back to the experience.